The lecture has been changed to Monday, April 15, 2019 from 7 pm - 8:15 pm in Hubbel Hall. 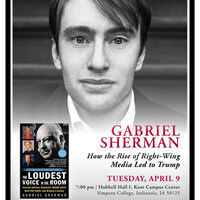 Simpson Forum & Humanities Division present author Gabriel Sherman on How the Rise of Right-Wing Media Led to Trump. After the lecture, Sherman will sign copies of his book, The Loudest Voice in the Room: How the Brilliant, Bombastic Roger Ailes Built Fox News - and Divided a Country. Co-sponsored by the Culver Public Policy Center and the Dept. of Multimedia Communication at Simpson College.